Favorite childhood confections are reinvented with innovative twists. At fine restaurants across the country, nostalgia is inspiring innovation in the kitchen. From s’mores fondue to gourmet takes on Snickers, favorite flavors from childhood are back on the menu as chefs reimagine classic treats. While the desserts may be reminiscent of simple sweets, these modern versions feature creative, high-end spins for discerning palates. Cortney Harris, executive pastry chef at Sea Island, theorizes that the sweet trend is largely driven by millennials. “They are looking for picture-ready desserts, desserts that tell a story, desserts that remind them of something else,” Harris says. At Pittsburgh restaurant Six Penn Kitchen, a member of Eat’n Park Hospitality Group, the Six Penn Circus dessert reminds diners of trapeze acts, clowns, carnival games and more—all the childhood excitement of the circus presented on one flavor-filled plate. 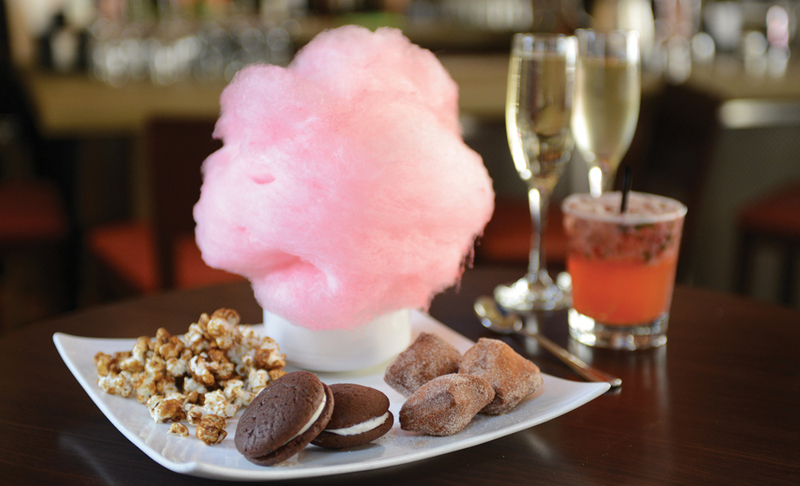 The dessert includes an assortment of house-made treats that many will recall from visits to the circus: a bowl of fluffy pink cotton candy—spun in-house—with whoopie pies, freshly made beignets or doughnuts and Cracker Jack-like caramel popcorn. “We meant to have really good food but not take ourselves too seriously,” he says. “We were looking for something that was fun that would create nostalgia and also be something good to share.” That’s when the notion of circus or carnival-type confections came up. Six Penn Circus met the goal of a lighthearted, shareable sweet that transports diners to another time. Recollections of summer camp and nights spent among the stars are captured in creative, adult versions of a childhood favorite: s’mores. For Pennsylvania native Harris, s’mores memories are associated with midnight toboggan runs. “We would always make them afterwards at the fire,” she recalls. Harris estimates the treat has been featured “probably 12 different ways” at Sea Island’s restaurants. Past variations have included s’mores crème brûlée: chocolate custard paired with toasted marshmallow ice cream, homemade graham cracker crumbs and marshmallow crispies. The current version, a dippable s’mores fondue with warm chocolate cake and caramel, is served at the resort’s Southern Tide restaurant. The traditional chocolate bar is replaced with a flourless chocolate cake that is diced, warmed and then topped with a drizzle of caramel sauce; the graham crackers are made in-house with a sugary, cinnamon crust; and, of course, marshmallows. The delectable concoction is caramelized with a torch to give it that classic roasted flavor, taking diners back to youthful evenings spent around the campfire. But Harris believes the originality of the Southern Tide dessert is as much of a draw for guests as the nostalgic component. “I get requests for recipes all the time,” she says. The top-selling s’more is currently even more popular than the Gold Brick Sundae, “a Sea Island classic favorite from the beginning of time,” Harris jokes. The dish features scoops of homemade vanilla ice cream coated with chocolate sauce that hardens, giving it a deliciously crunchy texture. When the s’mores surpassed the famous treat, “that’s when we knew it was a hit,” she says. Across the country at Abigaile in Hermosa Beach, Calif., another nostalgic confection also claims the title of the restaurant’s best-selling dessert: The AB ‘Snickers’ bar is a gourmet version of the classic candy that’s captured hearts since the 1930s. Abigaile’s take features soft nougat, peanuts, a hard chocolate shell and a whipped peanut butter cream, and is garnished with salted caramel and roasted peanuts. “Snickers bars are the best mass-produced candy bars ever made, then they made the ice cream version which is amazing,” says Abigaile’s Chef Jorge Valines. “Imagine these two having a baby—that’s what the AB ‘Snickers’ bar tastes like.” Valines believes that nearly every American has tried a Snickers bar, and for him, the flavor is linked to fond memories of Halloween. “Do you remember going trick-or-treating and getting those small Snickers bars? I am sure many of us do,” he says. 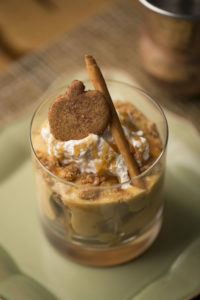 At Tavola, Sea Island’s Italian eatery, the pumpkin spice budino was also created in honor of fall festivities. The flavors were inspired by the ultimate Thanksgiving dessert—pumpkin pie. Whether it’s a day at the circus or a night at summer camp, sentimental sweets have a unique way of taking us back to simpler times. The creativity displayed in these modern variations inspire diners to order them again and again. 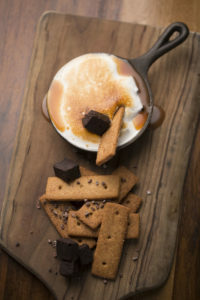 Harris says that guests often make comments about the s’mores such as “tastes like home” or “reminds me of scout campfires,” while still admiring the originality of a new version. As part of his new role at The Lodge, Badger handles the roasting, ensuring a perfect preparation of the delicious dessert. But Badger’s s’mores go beyond the old-school combination of Hershey’s chocolate, graham crackers and toasted marshmallow. The new s’mmorier menu offers innovative versions with nontraditional, gourmet ingredients. Options include Grasshopper, with dark mint chocolate, chocolate graham crackers and vanilla marshmallow; Peaches & Cream, with white chocolate, classic graham crackers and peach-flavored marshmallow; and Chocolate Hazelnut, with hazelnut-infused chocolate, classic graham crackers and marshmallow crusted with coconut.